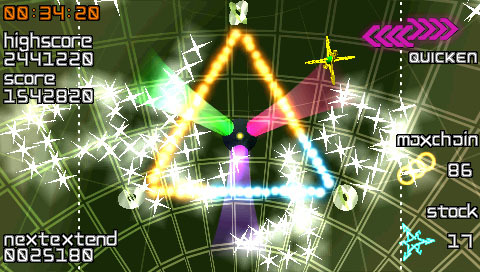 For those familiar with the work of Tetsuya Mizuguchi and Q Entertainment, it is somewhat par for the course in that it is developed around the concept of “synaesthesia” — the subconscious connections that some people make between different sensory inputs, in this case sound, visuals and “touch” of sorts through gameplay. But for everyone else, it’s an initially baffling experience that, before long, becomes utterly compelling and fiendishly addictive. Every Extend Extra is based on a PC game called Every Extend, originally developed by Kanta Matsuhisa, working under her pseudonym of “Omega”. 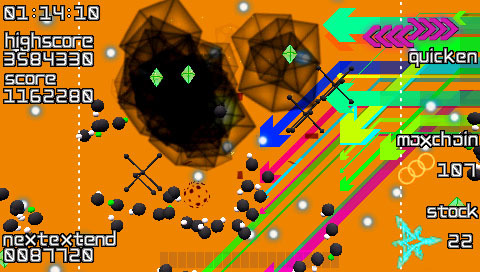 Originally released in 2004 as freeware, Every Extend provides a rather peculiar twist on traditional shoot ’em up gameplay by preventing the player from actually shooting; instead, the only way you can defeat enemies is to deliberately detonate your ship and cause chain reactions of explosions using anything caught in the blast radius. 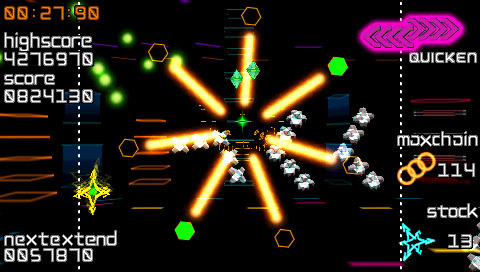 Every Extend’s basic mechanics bring to mind classic arcade games, particularly Atari’s Missile Command and Liberator, both of which made use of a similar system of chaining explosions together for efficient destruction. The fact that you’re deliberately giving up your own stock of lives (which begins much larger than your typical old-school arcade game) is an interesting twist, though, and since this aspect is such a focus of how the game works, there’s also a strong emphasis on earning extended play by reaching various score milestones — hence the name. Every Extend is a simple and straightforward but extremely addictive game that caught the attention of Mizuguchi and the team at Q Entertainment — legend has it as a result of an employee who skipped several days of work to play it, though it’s difficult to determine how much truth there is to this particular story. 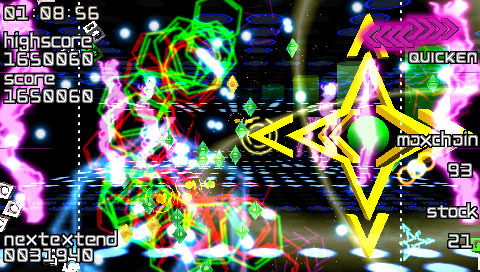 The company adapted the basic formula and added their synaesthetic twist to it after refining its style in Lumines for PSP and Meteos for Nintendo DS. The result was a game even more hypnotic and trance-like in its aesthetic than its source material, since the abstract visuals were now combined with throbbing, pounding electronic beats. It proved to be a potently addictive combination, the very essence of arcade-style “just one more go” gameplay, even though its difficulty level for those unfamiliar with its quirks might seem a little on the high side. Every Extend Extra, as the new version was known, added a few refinements to the gameplay as well as the distinctive audio-visual aesthetic. Now as well as simply detonating your ship, you could charge up for a larger explosion, or leave the “core” of your ship — the part that detonates — in a particular place and move the rest of it elsewhere, allowing you to prepare for a particularly large swarm of enemies without having to manoeuvre carefully around them. 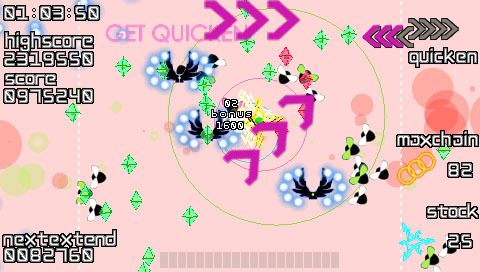 There are some power-ups in the mix, too, most notable of which is the option to “Quicken”, which speeds up the music slightly and increases the intensity of the incoming enemies. Using Quicken effectively is essential to attaining higher scores — and those all-important Extends — but also ramps up the difficulty, too. There is also a special technique you have to use to get Quicken up to the maximum: normally, you’re capped on how many Quickens you could apply at once, but if you wait until several are on the screen before picking them up, you can exceed this limit for even more scoring potential… and difficulty! Gameplay in both the original and the PSP version is broken up with boss encounters, but in keeping with the rest of the game these aren’t your standard shmup bosses. Rather than simply blasting away at these, bosses generally require you to perform special techniques in order to damage them — for example, hitting them with an explosion at the end of a combo. 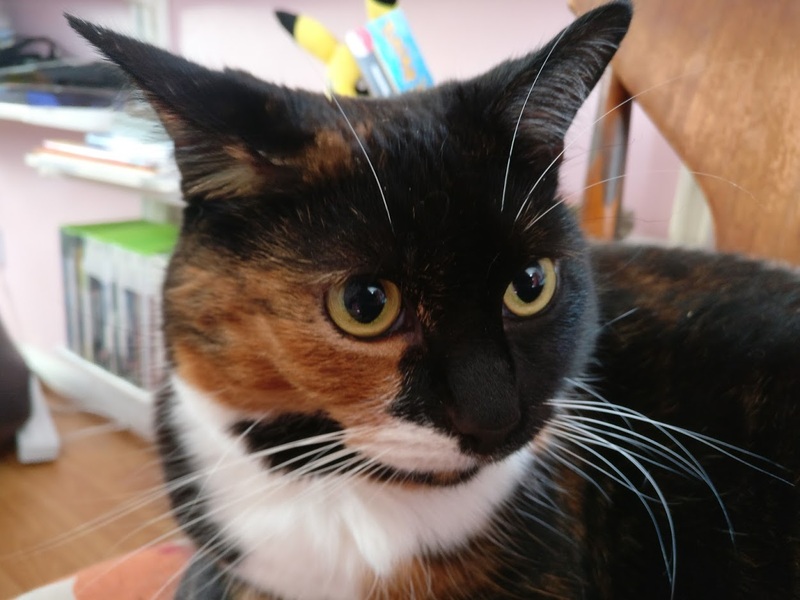 Consequently, boss battles become about careful positioning and dodging mechanics, then very precise timing to ensure you fulfil the conditions effectively. They’re challenging, but immensely satisfying to complete. Every Extend Extra as a whole features a lot of subtle little touches that make it more pleasurable to play the more you observe it. 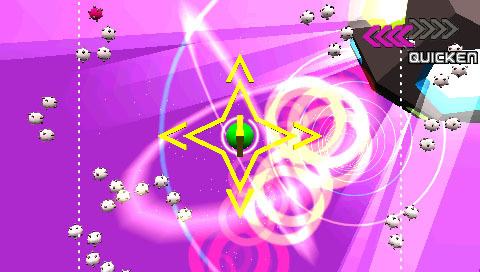 For example, you can manipulate the direction the power-ups will “drift” across and out of the play area based on where you are when you detonate your ship, and making use of this mechanic effectively is important if you want to break your Quicken limit or simply ensure you’ll be able to pick up the power-ups you produce. The game is full of little things like this; while it may initially seem dauntingly difficult and more than a little frustrating, taking the time to engage with it and understand what it’s truly doing is very rewarding in the long term. Every Extend Extra on PSP was later followed up by a digital-only Xbox 360 version called Every Extend Extra Extreme. This features a beautiful high-definition “vector-like” aesthetic with LCD-style score displays and psychedelic effects that increase in intensity the better you’re doing. There’s also new music and a marginally more accessible difficulty curve, making it a bit more friendly to newcomers than the punishing PSP edition. It also features the option to play with your own imported music rather than the built-in soundtrack as well as a more conventional shoot ’em up mode known as “The Revenge” for those who enjoy such things. All in all, a pretty substantial package. The two versions are actually noticeably different from one another and as such are both very much worth having in your collection. 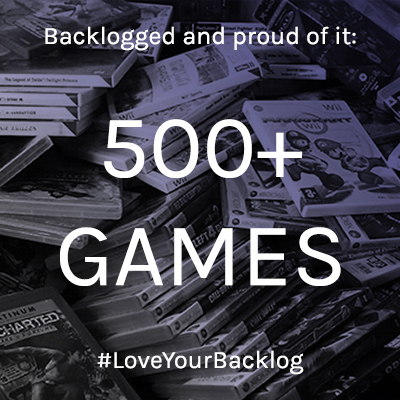 It’s a bit of a shame that the Xbox 360 version didn’t get a physical release, but that generation of consoles is when one might argue experiences such as Every Extend Extra and its ilk started to become somewhat “devalued”, for want of a better term, deemed somehow “lesser” games unworthy of being seen on store shelves or in an enthusiast’s collection. Or, from a different (and somewhat more positive) perspective, perhaps it’s more accurate to say that the console market became more stratified, with the rise of widespread broadband Internet connections making digital-only games and their significantly lower price point a much more practical, viable and attractive option for developers, publishers and consumers alike. 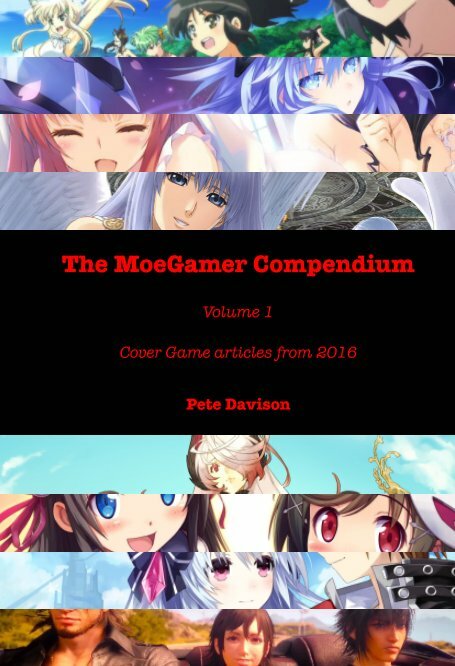 Either way, the Xbox 360 version is digital only, but it is compatible with Xbox One, so in theory it should remain available for a good while yet at the time of writing. Grab it while you can. However you choose to do it, some form of Every Extend Extra is well worth playing. Your initial reaction may well be confusion and bewilderment, but push through that and you’ll find a compelling, unique experience that will have you seeing explosions and hearing throbbing basslines in your sleep. And who doesn’t want that? My vague memories of the PSP version are that “punishing” is a very appropriate adjective. Still, love Mizuguchi’s games, especially Rez. Yep. What a genius. Absolutely timeless games that I always have time for. No, I’m rubbish at it on PSP! I’m pretty good at the Xbox 360 version, though that one is noticeably easier!